To quote the sage, Pogo cartoon – we have met the enemy… and he is us! Here is my challenge to you today. This challenge will require less than 5 minutes of your time – but it could be one of the best things you can do for your inventing venture. So here it is. Those are the easy answers – the ones you want to blame for hold ups. Right? But, there is almost certainly a much bigger cause of setbacks. Are you ready? 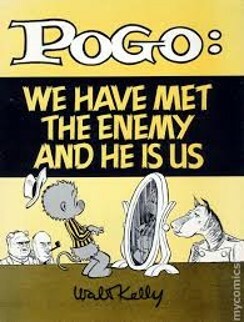 Just like the Pogo cartoon – go look in the mirror – and you will see the enemy – is you! Grab your FREE copy of – Slaying the Procrastination Python – PDF now. Just click on the blue button below. Want to learn how to license your invention for royalties? Attend our FREE live webinar – License Your Invention for Royalties – now. Click on the orange button below to save your seat. All you need is your laptop or cell phone to attend. Sorry I called you out! But, now it's my turn to look in the mirror. Yep, it's not just you. The procrastination python lurks in my head too. Today, as with every Sunday, I have a lot of tasks to get done in my business. It is said that weekends are simply two more workdays for entrepreneurs – and it is true! One of my Sunday tasks – which takes a bit of time – is thinking up my blog topic for the week, then writing a hopefully cogent post, then publishing it. Sounds easy, but it is not. It typically takes me 3+ hours to do my blog each week. It is very easy to put it off till later (see the picture above). For example, I spent an hour this morning working on a new spreadsheet to chart downloads of my podcast so far. It was fun… but was it really the best use of my time? Probably not. So, I can spend much of the day working on various tasks – then suddenly, the day is almost over and I have to get my blog written and published. Yikes! Can you identify? I bet you can. No matter the task at hand, it becomes a lot more stressful to accomplish, once you have procrastinated until your time is just about up. So, let's look at some proven solutions to slaying the procrastination python. If you have 5 tasks on your to-do list, probably 4 of them are fairly easy and quick for you to do. Right? But, the fifth task – not easy – or quick. But, it is the most important one on your list – it is the metaphorical Frog. Right? So, you work on the 4 easy tasks first – feeling as if you are making a lot of progress – much like my choosing to work on my podcast spreadsheet instead of working on the blog. But, at the end of your day, you've finished 4 unimportant small tasks and the single most important task – the frog – is still sitting there, ready to greet you again tomorrow morning. Right? Don't you hate that? This happens to you at work – and it also happens in your inventing business as well. So, time to eat that frog first! Once you tackle eating the frog task, something interesting and unexpected happens. Every time. It is not as bad as you thought! The more we ruminate without action, the more the looming task seems to ominously grow in scope. But, jump into tackling that big task – and it really isn't so bad. You find you're making real progress on a task that is very important. You'll get it done sooner than you expected and – guess what – the whole rest of your day will be easier and less stressful. I guarantee it. What are some of those frog tasks for inventors? Calling companies who may be interested in licensing your product. Hmmm… maybe tomorrow…. maybe next week. Maybe never! How about today? Solution #2 – What is the Worst That Could Happen? Most procrastination is driven by fearful, irrational thinking caused by our lizard brain – something called the amygdala ‘hijack.' It is part of the primeval ‘fight or flight syndrome' wired into all of us, that may have saved us as cavemen (and women) from the saber tooth tiger attack, but won't save us from the boss. Here is a very simple solution. When you find yourself procrastinating and putting off an important task – odds are your amygdala is the culprit. Call the prefrontal cortex (the thinking part of your brain) to the rescue. Simply ask yourself, “what is the worst that could happen?” You'll get an answer from the rational part of your brain. Maybe you're putting off asking the boss for a raise. Or, you're putting off going to show your invention to the buyer at Lowe's. What is the worst that could happen? The boss could say ‘no' or the buyer might not see the merit in your invention. Then, you're no worse off than you are right now! But, by eating the frog first and taking action – there is a real possibility that the boss may actually say ‘yes' to your raise – or the Lowe's buyer may be interested in your invention. You'll never know until you try. 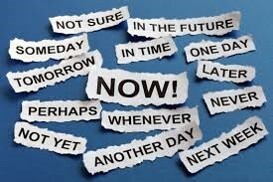 Why procrastinate where there is no downside for taking action now? Only upside. Tell me if this helped!